Grace Hospice is looking for veteran volunteers to provide end of life emotional support and companionship to our veteran hospice patients. 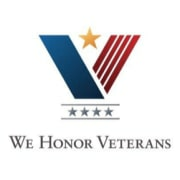 We are a Level Four partner with We Honor Veterans and take pride in honoring our veteran patients as they move through the final stages of their journey. Veteran volunteers are an integral part of the care we provide for our veterans. There is additional veteran to veteran training for those interested in volunteering. Minimum of 1-2 hours per month, per assigned patient.